1) We make 6″, 8″ & 10″ diameter, dry (19% or less moisture content), Alaskan Spruce, Swedish cope, numbered, stress relieved with a top kerf cut (8″ & 10″ logs), precision round milled logs with saddle corners. Our 8″ & 10″ Superior Logs make Alaskan 4 star plus or 5 star energy ratings! 2) Superior Logs are predrilled 4′ O.C. or less & 12″ or less on either side of openings for our 5/8″ all thread bolt system starting at the foundation through the top plates with dual top tensioning springs. Foam gaskets go between each log. The logs range from 2′ to 16′ lengths, bundles weigh approx. 2,500 lb., clear poly wrapped, metal strapped & end “X” braced for easy handling. 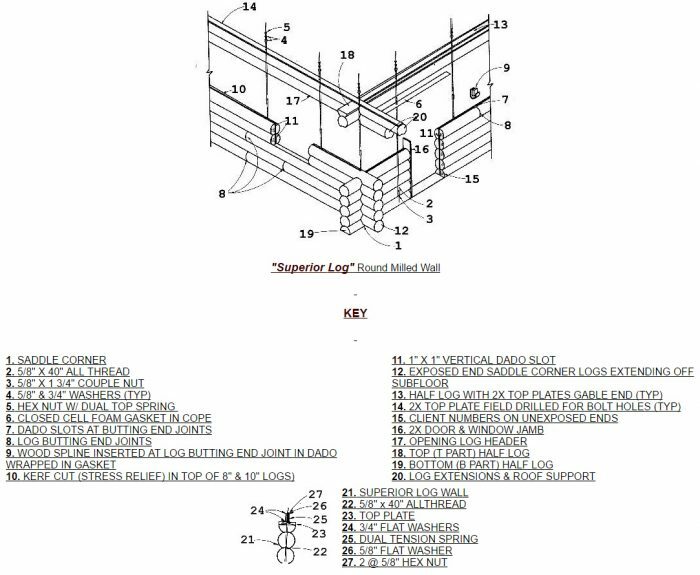 3) Our 1, 2, 3, … log numbering system & log wall layout shows each log by number in each wall plus each bolt & opening location. Our easy to follow stacking guide allows anyone to assemble our Superior Logs in hours with only man & womanpower!! No representative is needed at site. 4) We provide quality & thorough weathered-in shell packages & a detailed materials list showing all materials & their use in your building. Your building is beautiful, natural & ALASKAN!! 5) We will create a custom plan or use yours. Our plans are designed for your location, conditions & desire. Our plans are affordable & included in our shell packages!! ALASKA is the most demanding construction location in the world!! SUPERIOR LOGS have been used for hundreds of cabins, homes, lodges & commercial buildings throughout ALASKA. We must be doing something right!! COME FIND OUT! !